Shauna and Matt Damman were living a happy, busy life in Detroit, Michigan, enjoying their growing family, when they stumbled upon a genius idea that was the solution to a problem, but also a lot of fun. Rather than just keep it to themselves, they dove into the world of manufacturing, marketing and selling, so that the world could enjoy the benefits of their invention, Walkie Chalk®! 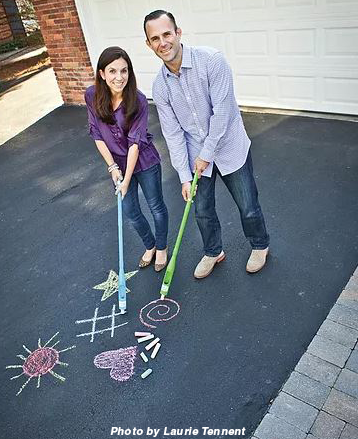 Like most involved parents, Matt and Shauna enjoy spending time with their children, and during warmer days this always included drawing with sidewalk chalk. Shauna was outside with her children shortly after having had a C-section with her third child, and her two older children wanted her to draw with them. Shauna wanted to play, but she couldn’t easily get down on the ground because she was still recovering. Rather than miss out on play time, she had an idea and quickly came up with a solution. A little while later, from just a few feet away, Matt saw his wife drawing—but, she wasn’t crouching, kneeling or sitting on the ground…she was standing! Shauna had zip-tied the sidewalk chalk to a rake handle, so she could stand up and draw, and it was working! Matt recognized the brilliance of it and how others could benefit from such a product. Parents would love using it to play with their children without having to kneel down and get dirty, and kids would love the fun new way to draw outside! Obviously, the Dammans couldn’t sell rake handles with zip-tied chalk, so Matt worked on figuring out a new design. “One struggle,” Matt said, “was how it could hold sidewalk chalk in a way that stayed tight, but also had ‘give’ and allowed children to draw without the chalk breaking. It also had to be super simple and easy for any child to use.” Matt had the idea to use foam to make it work, much like a pool noodle, and that lead to the current foam material used on Walkie Chalk, which is now patented. The material holds chalk well and allows for easy drawing, as well as simple switching of chalk. It can also hold just about any sidewalk chalk, round or square! Walkie Chalk went through several revisions and prototypes— over 25 versions were toyed with and tried—before it became what you see today. Through the process, Matt made sure to always have others try and test his designs, keeping an open mind to change and improve. It took that much work to make it so simple, which was Matt’s main criteria for the product. It was an experience he and his family enjoyed, having fun with it and embracing the challenges of production and selling into retail. Their first purchase order came from Ace Hardware, with Hobby Lobby, Toys “R” Us and other retailers soon after. As Walkie Chalk becomes more popular and is available in more stores, Matt continues to listen to consumers and enjoys hearing stories of how Walkie Chalk is used. He and Shauna stay involved in the marketing and development of it through PlayMonster, and can’t wait to see where it goes next!